What's better than a quart of luscious homemade ice cream, sorbet or frozen yogurt? Two quarts! 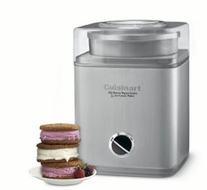 The fully automatic Cuisinart® Pure Indulgence™ makes 2 quarts of your favorite frozen desserts or drinks in as little as 25 minutes. It's easy -- an integrated motor, double-insulated freezer bowl and automatic mixing paddle do all the work. Results are consistently smooth, cleanup is easy, and the brushed metal styling is simply sensational.